From his taco shop in Nicoya, Johel Israelsky wants to see if he can reduce plastic consumption, but the challenge is always the same: “It’s too expensive. These are products that we need, but it’s not profitable. It makes my production more expensive,” he says, adding that takeout food is one of the most important components of his business, the taquería Al Pastor. Israelsky’s business is one of many in Guanacaste that would like to implement plastic-reducing measures, but have found it difficult to do so due to a lack of municipal support or high prices. Juan Pablo Berrocal, owner of the restaurant Jauja, in Liberia, agrees. “I started with recycled cardboard containers, but they were really expensive, so much so that my distributor closed because it didn’t work for him,” he said. For Berrocal, another obstacle is that many customers ask for a plastic bag when they leave with the food. “I offer a discount for people who bring a container to take out food. People still insist on straws, so I’ve started offering paper ones,” said Berrocal. Israelsky started asking people if they want plastic bags when they get food to go. He also started offering paper straws, although they aren’t always well received. Although there are national strategies to reduce the consumption of single-use plastic, not all of Guanacaste’s municipalities have incorporated them. 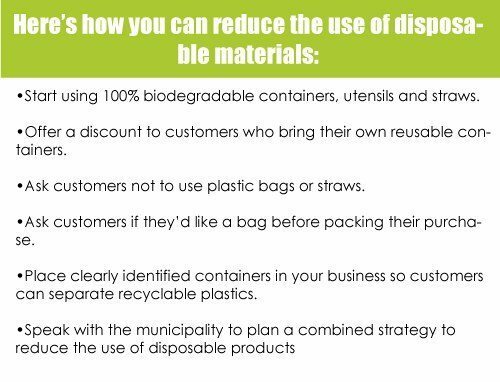 The national strategy to substitute single-use plastics with renewable, compostable alternatives is one of them, in which the national government, the Marviva Foundation, and the United Nations Development Program (UNDP) all participate, among others. One of the keys to the strategy is to make recommendations and guidelines so that municipalities and other institutions don’t have to wait for a legislative process, which could take years, according to Kifah Sasa, the coordinator of UNPD. “A municipality (can create) a fee that incentivizes permit-holders to reduce the consumption of single-use plastic,” Sasa said. But these kinds of strategies are still not a priority for some municipalities. Although Santa Cruz has touched on the subject, the head of environmental management, Daisy Víquez, says that there are currently other, more urgent priorities. “We would see a program to reduce plastic consumption within three years. We are currently focused on getting financing for the Recovery Center for Valuable Waste,” said Víquez. This situation has led to the creation of new ideas. One of them is Avani, which will present an alternative this October: edible utensils. The idea came about when the owner, Esteban Jiménez, saw how much plastic straws pollute. “Most people who ask us for products are from Guanacaste or the Southern Pacific. The need is there,” he said. For him, the key is bringing in plastic alternatives that people feel motivated to buy. That’s why he’s not only looking to edible utensils, but also biodegradable straws and bags made from yucca. His company is associated with the national strategy, known as Zona Libre de Plástico, or Plastic-Free Zone. Another associated company is Green Solutions. They offer environmentally friendly containers, plates, and place settings. Its owner, Paula Soto, recognizes Guanacaste’s efforts. “The province is very active in this subject. There is a large population of foreigners that are interested in conservation,” said Soto.